I’ve been working on a 57 Dodge distributor. A lot of what I found applies to our Letter Cars so I thought I would share some information. I was going crazy trying to find OEM 1957 parts for the distributor vacuum advance can. Some that I found were a nice shiny looking part only to find it had a bad rubber diaphragm. I finally found a fresh new advance that works. It is the VC155 vacuum advance. The good news is it costs only $15 from Rock Auto and is still a production part from Standard Motor Parts. This advance can be adapted to our distributors (A block 1957-58 anyway), just punch out the pin and break off tab (see photo). Here is a 1957 Dodge distributor with the VC115 vacuum advance installed. Note fit of arm on early pin. The stock 57 advance was 13 degrees (see next photo). The VC115 advance is 12 degrees. In my opinion, one less degree of vacuum advance is immaterial. Vacuum starts its advance at 9”. With 30 degrees max mechanical advance the vacuum advance can add 13 to total 43 degrees and this would be only at light loads such as highway cruise. This improves gas mileage. The new advance is preset to 12 for a total of 42. 43 degrees versus 43, that is OK. Note 13 stamped in the arm. That means this vacuum advance adds 13 degrees. 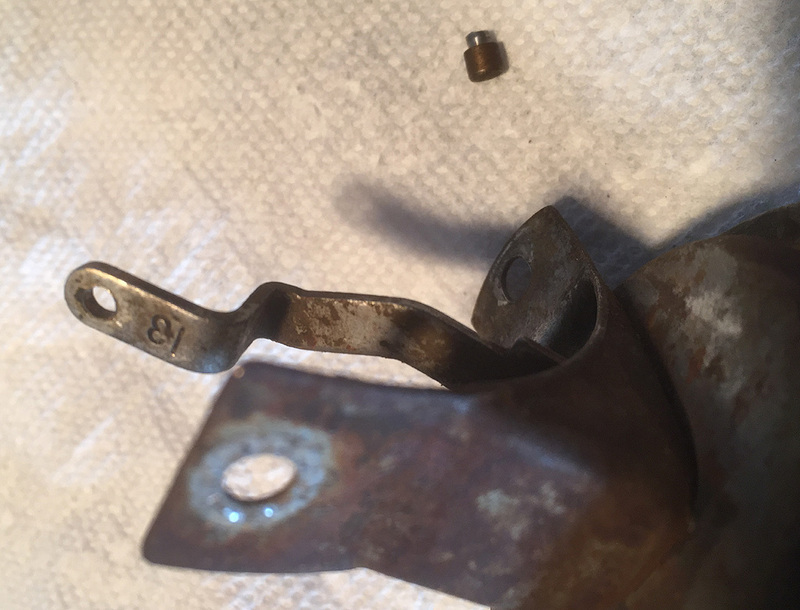 Note the little stepped pin removed from the vacuum can arm. Removing this pin allows the late can to fit on the early distributor male pin. Later distributors have a female hole that this pin drops into. I removed it with a bench grinder or you could file the small side, then hit with small punch and it falls out. The bend on the arm bend on the later vacuum can is slightly less but mine fit fine anyway. Check that the arm does not scrape under point deck. The later vacuum can has tabs that index the distributor cap. You break off the one pointing up with pliers. Early ones index the cap with the side clip snap mounts. Punch mark which one is the high one. That fits into cap. On mine it was the one nearest vacuum can. We will be trying this idea on a 392 300 D distributor (dual Point) and will let you know how it works. Another point: the wires or tape balls in distributor must not bind the distributor plate or you get very low gas mileage. Note the lead wire position and the shape of condenser wire in this photo. It is OK for the lead wire to go up a bit (within reason) as shown to flex as long as it does not entangle rotor. There is lots of space up inside the distributor. Don’t worry, the high voltage will not arc downwards since the distance is too far and rotor plastic is in the way. The metal part of the points with spring is at same voltage as lead wire, so short is not an issue there. The bare wire as shown is OK as it flexes better than the old wire with hard rubber insulation. Let's turn for a minute to the dual point distributors in our Letter Cars. The little jumper wire from the input nut to the point set is factory insulated with a loose cloth sleeve. Unfortunately that falls off as it gets old. Taping the jumper wire is a big mistake. The breaker plate moves rotationally with vacuum advance, flexing that wire. That will break off the small wire at the end of the tape ball! Normally the untraflexible wire is in a U shape and free to bend on its whole length. You also don't want to be tucking the wire down against the distributor body as this jams the vacuum advance too. There is a company called Olflex that makes ultra flexible wires. We should repro that wire and get rid of that crazy pile of mismatched odd design terminals on the screw, too. Must have been an ME doing EE. This is the totally shot 1957 can. The rubber diaphragm was rotted away (*). (*) Test the diaphragm with a mity vac while still on distributor to observe action. Testing it off the distributor may move the diaphragm too far, damaging it. In real world use, it appears to move only about 3/8”. New vacuum can on 300D dual point distributor.